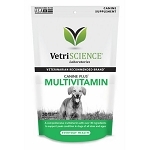 Canine Plus Multivitamin is specifically formulated with a balance of vitamins, minerals, fatty acids, antioxidants, and other nutrients to help maintain the physical health of dogs of all ages and breeds. Biotin to promote moisture and elasticity in the skin and healthy coat growth. Antioxidants (A, C, and E) to fight free radical damage and support the immune system. Vital minerals to support proper composition of body fluids, and the formation of bone and red blood cells. EPA and DHA to support healthy skin and coat, and normal brain function. 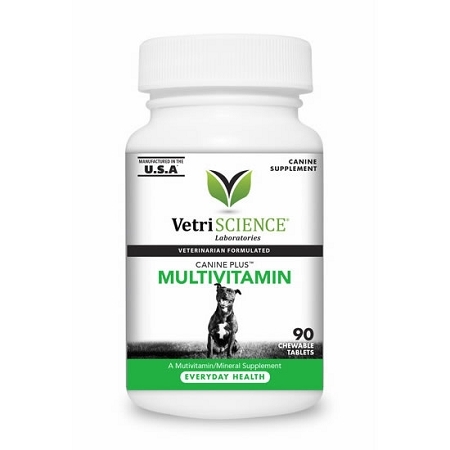 Canine Plus™ Multivitamin is specifically formulated with a balance of vitamins, minerals, fatty acids, antioxidants, and other nutrients to help maintain the physical health of dogs of all ages and breeds. Each bag contains 30 chews. 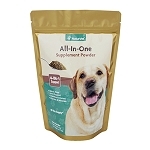 Ingredients:brewers dried yeast, dicalcium phosphate, calcium carbonate, microcrystalline cellulose, silicon dioxide, stearic acid, fish oil, cellulose, natural duck flavor, vitamin E supplement, ascorbic acid, l-arginine, vitamin B12 supplement, dl-methionine, ferrous sulfate, zinc sulfate, niacinamide, d-calcium pantothenate, magnesium oxide, mixed tocopherols (a preservative), manganese sulfate, inositol, riboflavin, copper sulfate, pyridoxine hydrochloride, vitamin D3 supplement, vitamin A supplement, sodium selenite, thiamine mononitrate, biotin, folic acid, potassium chloride, calcium iodate. Under 25 lbs: 1/2 tablets daily. 25-75 lbs: 1 tablet daily. Over 75 lbs: 2 tablets daily. 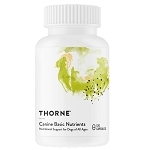 Thorne Research Canine Basic Nutrients - Dog Vitamins - 120 ct.